Ever since reading Roger Thurow's The Last Hunger Season I've been thinking a lot about global food issues and about how simple agricultural educational practices (e.g., how to space out seeds, fertilize, water) are huge game changers when it comes to sustainability and helping farmers in third world countries not only feed their families, but access other necessities such as education. 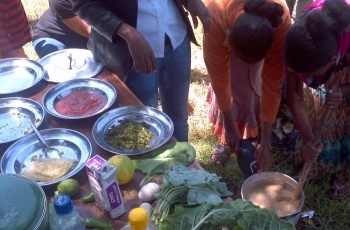 Our visits to USAID's ENGINE hub and a nutrition demonstration showed the progress being made in this direction. 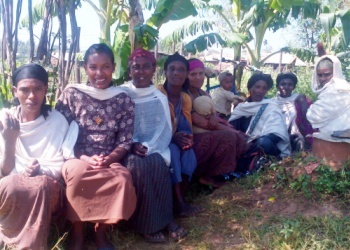 The ENGINE hub is in rural Ethiopia, complete with rolling hills and staggeringly beautiful vistas. But despite all of this land and the huge percentage of people for whom agriculture is their mainstay, millions of families struggle to grow enough food simply to feed their family, much less build up savings. This agricultural struggle leads to malnutrition, stunted growth, kids not being able to enroll in school, and other residual consequences. Aside from seeing the fruits of ENGINE's labor, there's something else I feel compelled to mention. During all of our visits we were swarmed by kids who wanted us to take their pictures then look at them on our phones. It was pretty much the most awesome thing ever for them! 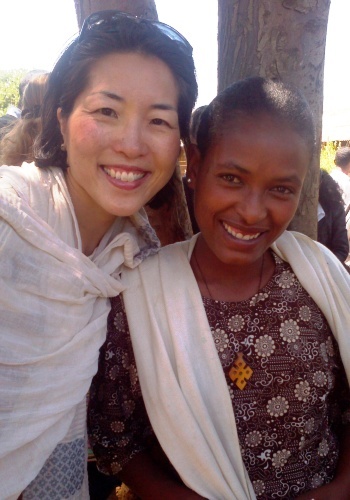 And what struck me repeatedly through our time in Ethiopia was the openness and generosity of people. Throughout the trip, I was definitely aware of not invading people's space -- I asked before taking pictures, I wouldn't enter rooms where patients were getting treatment...I basically didn't want the people of Ethiopia to feel like a spectacle. And as we were departing, we had the benefit of a translator. We asked if the moms had questions for us. They said, no questions, but just that they were so happy to have us there and so grateful that we took the time to come. My eyes filled with tears and I said, "The honor is ours." Sign up to become a ONE Mom (it just takes a second!) and follow along on the blog and also on Pinterest, Twitter, Instagram, and Facebook. I'm in Ethiopia at the kind invitation and expense of The ONE Campaign, a nonpartisan, advocacy organization dedicated to the fight against extreme poverty and preventable disease, particularly in Africa. ONE works to convince governments (the US, as well as others) to invest in smart programs that help to eliminate poverty and preventable disease in a sustainable way. ONE never asks for your money, simply your voice.